We’d love your help. Let us know what’s wrong with this preview of Persuasive Copywriting by Andy Maslen. Using psychology, emotion, and a pinch of neuroscience, Andy Maslen, an experienced copywriter and marketer, presents 25 psychological techniques, 110 words and phrases that trigger emotions, over 10 real-world case studies, and 75 practical exercises to help practitioners and students who have already mastered the basics, write enjoyable, compelling copy which stands out Using psychology, emotion, and a pinch of neuroscience, Andy Maslen, an experienced copywriter and marketer, presents 25 psychological techniques, 110 words and phrases that trigger emotions, over 10 real-world case studies, and 75 practical exercises to help practitioners and students who have already mastered the basics, write enjoyable, compelling copy which stands out in today's cluttered marketplace. Maslen covers topics such as: how to make spending money look like a privilege, the ancient Greek secret of emotionally engaging copy, when to use pictures instead of words, how to use the right tone of voice, and avoiding common copywriting traps. To ask other readers questions about Persuasive Copywriting, please sign up. What did you expect? A book about persuasive copywriting manages to be engaging, enthralling, informative, accessible and a pleasant read. What next? The Pope is Catholic? A powerful combination of 25 different psychological techniques, 125 trigger words and phrases, case studies, quizzes and practical exercises is expertly weaved together by the author, a copywriting veteran, to pack one hell of a punch in a relatively slim book. The fine balancing act of being engaging and instructive for the b What did you expect? A book about persuasive copywriting manages to be engaging, enthralling, informative, accessible and a pleasant read. What next? The Pope is Catholic? A powerful combination of 25 different psychological techniques, 125 trigger words and phrases, case studies, quizzes and practical exercises is expertly weaved together by the author, a copywriting veteran, to pack one hell of a punch in a relatively slim book. The fine balancing act of being engaging and instructive for the beginner and a great resource for the experienced industry participant is met with aplomb. This was a very pleasant, hype-free find. Even when skipping over chunks of the text (exercises and quizzes in this kind of book tend not to attract this reviewer) you didn’t feel as if you are being short-changed by skipping ahead. Has anything been left to chance? You get an overload of theory, history, opinion, fact, forecast and practical demonstration. Your senses are being pummelled by information yet it doesn’t feel overwhelming. The author’s psychological approach is obviously working. This customer has been hooked by the author’s fishing line. Ker-ching! Yet this is more than just a “how to write copy” book. It touches on many disciplines such as marketing, advertising, promotion and sales which, of course, are related to the copywriter’s art but you are getting more than just a book that shows you the right type of words to write in order to reel that customer in. The scope and scale of the book’s coverage is interesting, showing that a skilled copywriter can work across a range of segments and effectively write (and sell) to everyone, everywhere. Despite focussing on a serious subject, this book did cause this reviewer to laugh aloud several times. Gems such as: “As a local utilities manager, you really don't want to make the front page of your local newspaper because you've flooded a playground with liquid sewage” – you will need to read the book to find out what this has to do with copywriting! That’s it! You need this book. In many ways even if you never, ever write an advertisement, website copy or anything that could be remotely thought as being sales or promotional-led, a book like this may help your general day-to-day communications and successes as the central messages are the same. Add it to your bookshelf today! I’m a little scared to write this review. Persuasive Copywriting by Andy Maslen is one of the most useful copywriting books I have read. But will my writing make the grade? Applying what I learned reading Persuasive Copywriting, all I need to do is present you, the reader, with the information to decide if this book is something that can solve a problem for you. So, let’s get to it. Without getting flowery, you’ve clicked this link, so you’re wanting to make your writing more effective. This book I’m a little scared to write this review. Persuasive Copywriting by Andy Maslen is one of the most useful copywriting books I have read. But will my writing make the grade? Without getting flowery, you’ve clicked this link, so you’re wanting to make your writing more effective. This book will help you do it. What I learned most from this book was how copywriting is more than the words. OK, so I already knew that, but it’s what impressed me most. It’s a full copywriting curriculum, with exercises, downloads and feedback: a great refresher of your college days. Actually, it’s more than what I learned in college and grad school. Persuasive Copywriting teaches the psychology of copywriting. There is a practical lesson on using a mix of ethos, pathos and logo in your writing. Yep, Aristotle in a copywriting book. Andy also makes the neuroscience behind the ideas easy to understand, and applicable. Oh, and scientifically accurate, which is better than the neuroscience and marketing book that I chose not to review. The end of each chapter has questions and exercises to test your knowledge. Also an invitation to tweet your progress to Andy. Promotion and feedback in one – I love it. The second part of the book goes into the more traditional copywriting tools of grammar, tone and pitch, and word lists. At first this seemed a little weird. Shouldn’t grammar be a top priority? But, it’s correct. Connecting with the reader is more important than choosing between a semi-colon and a comma. Our aim is generally for them to pull out their wallet. Who is Persuasive Copywriting for? Everyone who writes with a purpose. If you learned traditional copywriting and now need to add spice to your writing, then buy this. If you’re self-taught, then definitely buy this. Oh, and read it too. And do the exercises. Even though I’ve been writing for many years, it’s a good reminder for me and helps my arguments when coaching or chatting with clients. I’m working with a few non-profits, and I know their complaints would be that Persuasive Copywriting is too much about selling and, therefore, has no relevance to them. My response is a little creative and change “sell” to book, change, entice, or whatever fits your organization mission. The concepts are the same, nonprofits just don’t always take credit card payments, but they are selling. Everyone can learn something from this book. I could continue, but I think it’s better you read the book. After all, my goal was just to give you the information to help you make a decision whether to buy or not. 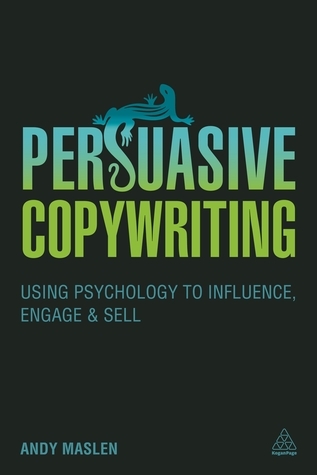 Persuasive Copywriting will be released on March 28. My copy was a gift of the publisher via NetGalley. This is must-read for entrepreneurs, especially if you struggle with copywriting. I'm pretty darn good at copywriting and I got a lot out reading this book. This book is a good resource for people getting into copywriting or want to improve their persuasive writing ability. Following the principle that people purchase primarily from primal emotion then bring logic in to justify the decision, the author steps through principles then illustrates them with compelling examples. He also has provided good resources on his website to complement what’s in the book. The social media section is a touch dated but still valuable. He does go on tangents like his This book is a good resource for people getting into copywriting or want to improve their persuasive writing ability. Following the principle that people purchase primarily from primal emotion then bring logic in to justify the decision, the author steps through principles then illustrates them with compelling examples. He also has provided good resources on his website to complement what’s in the book. The social media section is a touch dated but still valuable. It provides pratical and easy to digest techiniques on copywriting for business. Even though this was required for school, I still liked it. It was easy to read, not to mention funny. I didn't even feel like I was reading this for school. Beyond a couple of useful hints the examples are appallingly reminiscent of Facebook click bait. If I had to suggest only one book about copywriting to someone, this would be it. It has everything you need to sit down and start writing your first lines confident with the upcoming result. Mr. Maslen created a masterpiece that contains everything you need: how to, examples, exercises, swipe files, suggestions, etc. Whatever the price for this book is where you live (it was very expensive in Brasil), it is worth it. This book is more of a reference. You should read it once, cover to cover, but only as a layout of the material. Then you can find what you need over and over again — it's definitely in there somewhere. Faculty and academic librarians in undergraduate institutions will find this a useful addition to course readings or library collections. This book contains many useful examples and students will gain a better appreciation of the complexity of professional copywriting. Andy Maslen was born in Nottingham, in the UK, home of legendary bowman Robin Hood. Andy once won a medal for archery, although he has never been locked up by the Sheriff. He has worked in a record shop, as a barman, as a door-to-door DIY products salesman and a cook in an Italian restaurant. He eventually landed a job in marketing, writing mailshots to sell business management reports. He spent te Andy Maslen was born in Nottingham, in the UK, home of legendary bowman Robin Hood. Andy once won a medal for archery, although he has never been locked up by the Sheriff. He has worked in a record shop, as a barman, as a door-to-door DIY products salesman and a cook in an Italian restaurant. He eventually landed a job in marketing, writing mailshots to sell business management reports. He spent ten years in the corporate world before launching a business writing agency, Sunfish, where he writes for clients including The Economist, Christie’s and World Vision. As well as the Gabriel Wolfe series of thrillers, Andy has published five works of non-fiction on copywriting and freelancing with Marshall Cavendish and Kogan Page. They are all available online and in bookshops.